I have done Transcendental Meditation since I was 17 years old. I do 20 minutes in the morning and 20 minutes in the afternoon. I really believe it has helped make me the person that I am. Because it is an extraordinary way to release stress and allow it to dissolve, so that you can focus on what you want to focus on, and have your energy towards very positive things. An earlier insightful article written by Linda Egenes for Enlightenment, The Transcendental Meditation Magazine (Issue 7) sheds more light on this topic: An Interview with Sharon Isbin: The Monet of Classical Guitar. Knowing that Sharon had been practicing TM since she was 17 years old, Linda asked how it had benefited her life, especially performing in front of live audiences. Her amazing reply reveals an enlightened performer. When I perform onstage, I enter a state of being very similar to the one I enter daily when practicing TM. It’s a sense of communion with the energy of the universe, the audience, the composer, and the music—without ego or interference. It’s a feeling of unity between me and the listeners, a sense of “oneness” in which we are all experiencing the beauty of the music together. That sensation is one of the reasons live performances can be so powerful—everyone is focused and transported, and the experience is unique and in the moment, never to be replicated. Linda also asked Sharon questions about her musical influences and her work as a performer, teacher and collaborator, in particular about her new CD at the time, (August 30, 2011) Guitar Passions: Sharon Isbin & Friends. This promotional video shares music and interviews with Sharon and Steve Vai; in studio with Nancy Wilson (Heart) and Stanley Jordan; previews with Steve Morse, Paul Winter, Rosa Passos, Romero Lubambo, and Thiago de Mello. Sharon Isbin is also featured in a new documentary film that came out towards the end of last year, and is still being aired on public television: Sharon Isbin: Troubadour. The one-hour documentary produced by Susan Dangel (2014), includes guests Martina Navratilova, Michelle Obama, Joan Baez, Steve Vai, Stanley Jordan, Garrison Keillor, David Hyde Pierce, Janis Ian, Lesley Gore, Mark O’Connor, Tan Dun, John Corigliano, Christopher Rouse, Joan Tower, Leonard Slatkin, Thiago de Mello, Paul Winter, and more, with Isbin’s performances showcased from international concert stages to the GRAMMYs and White House. American Public Television presents the national broadcast on nearly 200 public television stations in the US Nov 2014 – March 2015. Video Artists International will release it on DVD/Blu-ray with added performances. See http://www.sharonisbintroubadour.com for screenings, broadcast, and release information. 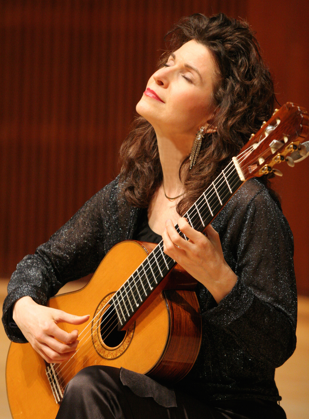 Today, Wed, January 7, 2015, WNYC’s Leonard Lopate interviewed Sharon Isbin about the program: A New Documentary On The Acclaimed Classical Guitarist, Sharon Isbin (16:33). Leonard asks Sharon about her Transcendental Meditation practice at the 10:50 mark. She answers at 11:08–12:20. Leonard mentions Julliard School inviting Sharon to head up a guitar department in their Music division and asks if Transcendental Meditation is part of the program. At the request of the David Lynch Foundation, Sharon did invite teachers to introduce the TM technique to Julliard faculty, staff, and students, offering to make it available for free. Listen to the interview here: http://www.wnyc.org/story/sharon-isbin. Visit Sharon Isbin’s website, www.sharonisbin.com, for more information: biography, press, music, videos, tours, and more. The perils of praise or blame for young writers. New ways to help students find their own voice.